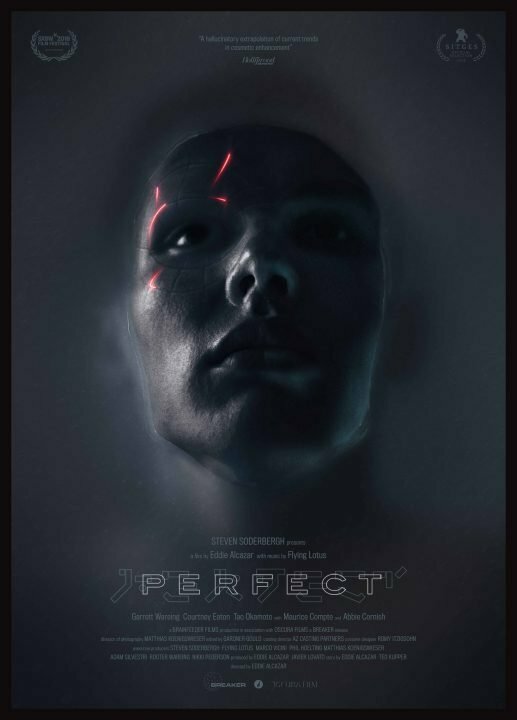 Perfect, a film by Eddie Alcazar takes viewers into a dark future of body horror that managed to be a hit a SXSW now has a release date. The film will now premiere in theatres in New York on May 17, and in Los Angeles on May 24. Once it is done it’s run there, it will be available on VOD exclusively through Breaker.io starting June 21. The film follows a boy in a dark who follows an advertisement that offers perfection though implants. As he descends into the pursuit of perfection, the implants start to heal his dark, twisted visions, but this all comes at a cost. As he constantly reaches for perfection with implants, he quickly finds out reaching perfection is not as easy as he hoped. Executive produced by Steven Soderbergh and featuring music by Flying Lotus, Garrett Wareing, Courtney Eaton, Tao Okamoto with Maurice Compte, and Abbie Cornish star in this dark science fiction thriller.